Executive Producer David Gelber accepts the Emmy. 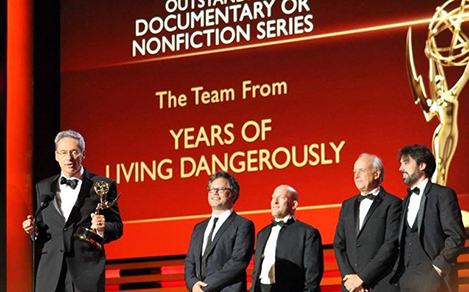 The "Years of Living Dangerously" documentary series on climate change won Outstanding Documentary Or Nonfiction Series at the Creative Arts Emmy Awards, traditionally held the weekend before the Primetime Emmys telecast, which will air Aug. 25 on NBC. The Creative Arts Emmys will air on Aug. 24 on FXM. Margaret Ebrahim, senior producer at the Workshop, was a producer on the series, which aired on Showtime earlier this year. She spent 15 months traveling the country to report stories on the impact of climate change.